A recent part exchange, this great little expander was built specially to be very simple to use with any midi equipped accordion. Although it’s easy to set up & play it has some excellent right hand, chord & bass sounds & is used by many top players. Supplied with set up & playing instructions. Also Ideal as a spare ‘backup’ expander for pro players. 3 month guarantee (excluding mains adaptor). FREE delivery to most of UK mainland. £10.00 GBP shipping to EU countries. To buy this Watkins Midi Partner 1 or get more details please call our Rochdale shop on 01706 658283. Wem MP1 MIDI Partner Detailed instructions & Specs. Note that these instructions apply to the Midi Partner Mk1 as well if you ignore the extra line of buttons. The control bpanel is divided into 4 sections as indicated by the similarly coloured rows of buttons, corresponding to 4 possible sections of a MIDI accordion – Bass, Chords and 2 Right-hand selections which may be used together as ‘layered’ sounds i.e. 2 sounds on at the same time, one from each section. The expander is designed to work with the standard accordion MIDI set-up with Bass on channel 3, Chords on channel 2 and Right-hand on channel 1 with an optional ‘solo’ or second right hand on channel 4 if it is sent – otherwise they work together from channel 1. Plug your MIDI OUT lead from your MIDI accordion into the MIDI IN socket on your MIDI Partner. Plug in an amplifier (or headphones) into the audio out socket. Plug in the external power unit into the power-in socket – you can actually do this in any order – Press the power on switch and all the lights on the unit should come on. Now turn the volume up a little on your amplifier and turn the MIDI Partner volume controls up, let’s say all controls half way to start with, and when you play your accordion, you should hear sounds immediately. Rh2-1, i.e. the first which is the upper left of each bank of buttons. On the right-hand sections, the instrument select buttons, if pressed a second time will turn the instrument off, this can be seen by the Mute light going off. Pressing the button again will select the instrument again; the Mute light coming back on to show the sound is unmuted. The Mute button may also be used to turn the sound on or off again. The power light is on constantly during normal operation but will momentarily flash off when a button or footswitch is pressed to indicate the event. The power light will flash another colour upon receipt of a recognised MIDI message which will show you if you are receiving MIDI from your accordion. A MIDI THRU socket is provided for connection to other MIDI equipment, should it be required. Each sound button on the control panel gives you instant access to one instrument sound and you have a choice of 10 for the bass plus a bass register button, 12 for the chords and 12 for each of the two right-hand sections which you can have on individually or together as layers. Each section has its own individual volume controls so you can balance your sound easily and individual reverberation controls for suitable instrument ambience. There is an octave register button on each right-hand section and they also have their own mute buttons, which allow you to turn off the sound instantly. They have indicator lights so you can see which section is on. In addition there are 4 optional footswitches which can be assigned to operate any of the buttons on the front panel allowing hands free operation of changes. The footswitch assignment is remembered permanently (even with power off) until changed again. This allows you to make seamless instrument or sound changes with your feet during performances. The mute buttons on the right-hand sections turn their respective sections sounds, on or off. If the light is on then the sound is on. If the light is off the sound is off. Each press of the button will change the state of the mute as shown by the indicator light. Any Right-hand sound button, if pressed again will also mute (turn off) that sound, the main mute light will go on or off to show whether the sound is on or off. The main mute button or a sound button can be used to change the state of the right-hand mute and bring back the same sound or another.. There is also an alternating-mute option, where, when Rh1 is on, Rh2 is off and vice versa.. If both mute buttons are pressed together, then the alternating mute is activated. Rh1 light will be on initially. The Rh2 mute button will now swap the right-hand sections i.e. as Rh1 goes off and Rh2 will go on, press again and Rh2 goes off and Rh1 goes on. To cancel this mode, press the Rh1 mute button. Rh2 could be assigned to a foot-switch so foot controlled operation is possible. If you require Bass and/or chords to be off, then one or more of the sounds may be programmed with a ‘blank’. This is also possible with the right-hand sounds if for any reason you do not wish to use the mute buttons and are willing to give up a sound. See the section on the ‘Sound editing’ mode. The right hand instrument buttons if pressed again will also switch off the instrument – the mute light will indicate the state of the right hand sounds. The octave register buttons may be pressed to change the selected instrument sound down one octave, pressing again returns to the original register and so on, pressing the sound select button again has the same affect as returning the sound to its default octave register. New sounds selected will always start in their default registers. With some sounds that consist of 2 layers, only one part is dropped an octave for variation. The bass note range may be changed by pressing the bass register button (which is at the position of bass button 6 and is a different colour to the bass sound buttons) to put it into a more suitable register with your accordion or the bass instrument range. After switch-on, the standard bass range is in operation, this may be lowered by about 2/3 of an octave by pressing this button to give a nice low bass end. The chords and bass have a sound-bank change button i.e. another bank of 5 sounds is available on the 5 bass or 6 on the 6 chord sound selection buttons. The lights, when on, show that the default Bank A is present and when the light is off then Bank B is present. Master tune control. If you need to change the pitch of the Midi Partner, press and hold the Rh2 Mute button until the Rh2 Mute light starts flashing and then release the button. The Rh2 reverb control will now act as overall pitch control over about a quarter tone. Press the Mute button again to store the tuning setting and return to normal. The bass sounds (and drums) may be played by the right hand by engaging the Orchestral Bass mode. Turn the power off. Hold buttons Rh1 and Rh6 and while holding, turn on the power again. The right hand sound select buttons will not function. The right hand lights will be off. Sound selection is done using the bass section. The Chord section will also function as normal along with the drums. To cancel this mode follow the same power up procedure or load factory presets. This mode may be useful for accordion orchestras if you are assigned to play bass/chord parts and prefer to do it with the right-hand keyboard. Solo/Forte button. When pressed, this button will change the volume level of the right-hand sounds. You may preset the button from no volume at all to a much louder than normal setting. By setting the volume to off, you effectively mute both right-hand 1& 2 sound together. To set the level, press and hold the solo/forte button until the bass bank light starts flashing, you can release the button now and use the bass reverb control to set the new sound level. Press the solo button again to store the setting and return to normal. If you change sounds, the solo level stays on. Hawaiian button. This produces a pitch-bend-down effect which jumps down and then slides up to the original pitch on the right-hand sounds. To use it, it is probably best to assign a footswitch to the button so it can be foot operated, this makes setting it easier as well. To change the setting, press and hold the Hawaiian button in until the bass and chords bank lights start flashing. The bass reverb control will change the slide up time and the chord reverb control will change the how far down the pitch will drop when the button or footswitch is pressed, the maximum down amount is 1 tone. You can test the effect by pressing the button or the assigned footswitch. To store the settings and exit to normal, press and hold the button again until the bass and chord bank lights stop flashing. Tremolo button. This starts a tremolo effect on the right-hand sounds. Tremolo is a gently changing volume effect, the speed and depth of which may be set. To change the effect, press and hold the tremolo button in until the right-hand mute lights start to flash. Right-hand 1 reverb control will now change the depth of the effect and right-hand 2 reverb control will change the speed of the effect. To store the new settings and exit to normal, press the tremolo button again. If you change sounds, the tremolo effect is cancelled so it will not appear on the newly selected sound. Drum buttons (1,2 & 3)control the drum sounds used on the Left-hand manual percussion which is a feature that will play a bass drum and open hi-hat (or other percussion instruments dependent on the drum set selected) with each press of the accordion’s bass buttons and a snare drum and closed hi-hat (or similar) on each press of the accordion’s chord buttons. This feature, despite its simplicity is remarkably useful if you can learn to play with it, as you basically have drums which follow you exactly and speed up and slow down with your playing. The Drum on/off buttons on the front panel will alternately switch the drum sounds on oroff. Also any of the footswitches may be assigned as percussion on/off, the same as the other buttons – the front panel button is still always available. If the one of the Drum buttons is held in for more than 1.5 seconds, the bass and chord bank lights will start to flash quickly, the button may be released while the lights continue to flash and it is now possible to change the bass percussion volume with the bass reverb control and the chords percussion instrument volume with the chord reverb control while the bass or chord sounds remain as they were. This level setting will be remembered permanently until changed again. As soon as the percussion button is pressed again, it will go back to its normal function of percussion on/off. The MIDI Partner MKII is fitted with 3 Drum buttons and each one will work as described above and each of the 3 drum kits volume levels may be set and are remembered independently. In all the editing (adjustment and setting) modes above, the power light will ‘blink’ with each incremental turn of the Reverb controls – which at this time are used as the editing controls. A footswitch may be plugged into any of the four footswitch jacks and assigned to any of the front panel buttons. The WEM 4 way foot-switch unit is a convenient way to use all 4 foot-controls. Press and hold the footswitch down (with your foot ?) and whilst holding it down, press and release the button you want to assign to it e.g. Solo/Forte button. Release the footswitch. Now, whenever this footswitch is pressed it will be the same as pressing the selected button in this example, the Solo/Forte button. So, you can assign four different instrument buttons to change or the Mute buttons so you can bring in another layer of sounds on the right-hand or the Octave or bass/chord change buttons for variations in performance or the drum select buttons etc. The footswitch assignment is remembered permanently (even with power off) until changed again, so when you power-up you can just press the footswitches to get your last used sounds. Advanced facilities – Sound changing using the Sound Programming (AKA ‘sound-try-out’) mode. By entering a special programming mode, each instrument select button may be assigned to 1 of 128 different sounds that are available including its own reverberation setting, so you can actually create your own expander with your own preferred sounds. If changing sounds gets out of hand and you want to start again, the WEM factory sounds are easily reset. The list of instrument sounds is basically the General MIDI standard selection of 128 sounds; see the Sounds sheet for a list plus a blank (no sound) at position 129. If you decrement down from sound 1 it will go to sound 129 or increment up from sound 129 will go to sound 1. The reverberation setting is also stored so if you wish you can just change the reverb setting without changing the instrument sound. To enter the sound-programming or ‘sound-try-out’ mode in normal play mode, hold down the Bass bank and Rh2 mute buttons simultaneously, all lights will clear and then the Rh1 & Rh2 mute lights will flash to let you know you are in this mode. By pressing the same buttons again, you can quickly exit this mode back to normal playing mode. Previously this mode could only be entered as a ‘power-up’ option by holding Right-hand 1 Mute button and then switching on the power, holding the button until the power light is on. This has been left as before, though the new method is probably preferable. The mute lights will flash to indicate that you are in the sound-programming mode. You can use two footswitches plugged into footswitch sockets 1 & 2 or the two right hand mute buttons to step through the sounds. Footswitch 1 or Mute Rh2 will step up (increment) through the list of sounds and footswitch 2 or Mute Rh1 will step back down again (decrement) through the list of sounds. Note that the ‘Mute’ buttons now have a different function i.e. they ‘scroll’ through the table of sounds – they no longer function as ‘mute’ buttons in this mode. You will have to turn down the volume of Right-hand 1 while you listen to the different sounds on right-hand 2 and vice versa as both right-hand sections will sound as you play the accordion to audition the sounds. All the other controls will otherwise work as normal. It may be best to try changing Right-hand 2 or the Chords sounds first as these are single instrument sounds. Some right-hand-1 and some bass sounds have 2 or 3 layers of instruments and the sound programming mode only allows you to change the main layer, so some sound changes may not be that successful on these sections. First ; Press the sound select button you want to change. Play the appropriate part of the accordion to hear the existing sound. Now as you play, press one of the 2 footswitches or Mute buttons. Each time you press the footswitch or button, the sound will change to the next in the list. To store the sound, just press the sound select button again. The reverberation level setting of the sound is stored so you may wish to adjust this as well. You may further change the sound and it will only be stored if you press the sound select button each time. When you are done, press the next button you wish to program and continue. If the button is not pressed a second time, then the currently heard sound will not be written in to that button, which is good if you decide not to change the particular setting – just press the next button you would like to try a change on. Some instrument select buttons have effects such as chorus, vibrato and other edited parameters on them and these will be effective on any new sound that is programmed into the particular button, so it may be necessary to put appropriate sounds in certain positions. Also, some buttons have layered sounds and one layer is fixed so you will only be able to alter one of the instruments, so it is best to start with the right-hand 2 section as these are all single sounds. Right-hand 1 has all layered sounds (2 and 3 layers) which may be confusing as only one of the sounds will change as you scroll through the sound list. The chords are all single layered but some bass sounds are 2 layered. Also remember that sound 129 is blank i.e. nothing will happen at all. If Right-hand 1 Mute and Rh1-12 buttons are held down together at power up, then the MT32 sound bank is selected. Load factory presets to clear back to the GM bank. If you want to reload the WEM factory presets so that the expander is returned to its original condition, press and hold the Chord Bank button while applying the power. Hold the button until the power light comes on. See the controls and functions reference pages for a complete list. Use as a GM (General MIDI) module. The unit may be used as a GM module by holding the Right-hand 2 mute button and powering up. Hold the button until the power light comes on. This mode is useful for feeding the unit from a computer or other MIDI sequencer that selects all the settings. via MIDI (some MIDI accordions will do this). Only the Master volume control is functional in this mode. The power light should be on and will flash its complementary colour upon receipt of a MIDI signal. The unit responds to the basic GM standards on all 16 MIDI channels. An MT32 sound bank is available by sending the appropriate Bank select message. See the MIDI sound and implementation sheets. By powering up with no buttons pressed down, normal (WEM) playing mode is entered. See the quick reference sheet for an overall list of operating modes. Q.: Everything is fine until I plug in a footswitch, then, the buttons don’t work properly. open-contacts, non-latching type, sometimes referred to as ‘sustain-pedal’ type as used on some keyboards. This is the simplest type of footswitch mechanism and has been chosen for its robustness. Use the WEM quad footswitch unit for guaranteed results. Q.: The volume or some other settings seem to change occasionally. A.: Check that your accordion is not sending out MIDI commands to make the changes. You can cancel all control messages that may do this by powering up whilst holding the bass bank button. This button toggles (switches alternately) to a notes only mode. The Notes only mode is the default setting from the factory-preset load (power up with chord button held) and makes the Midi Partner only respond to the minimum of MIDI messages and so it will ignore many messages that an accordion may send which are not necessary for basic playing and which may produce unexpected effects. If your MIDI Partner seems slightly different than the above instructions imply or different from another MIDI Partner you have heard, then this may be due to version differences, WEM occasionally change features in response to feedback from users. The latest system may be programmed into any unit by WEM. Call for details if this is of interest to you. Midi Partner was designed as an ‘antidote’ to the over-complex expanders that once dominated the market. Obviously to do this, some apparent sacrifices have to be made in the facilities available but as it was designed by accordionists for accordionists, what is has got, is targeted to the accordionists needs and to the needs of people who just want to plug in and get the benefits of electronic sounds without the hassle of learning to use a complex unit. To use the Watkins acronym for the philosophy, it is NYBWC (pronounced NIB WICK) which translates as “No YouBloody Well Can’t” : Basically this answers all the people who ask “Can I do this and can I do that with it ?” … …NYBWC! This isn’t to say that we don’t listen to everyone’s requirements, ‘demands’ and suggestions – we do and if universally applicable we may try to act on it. E.g. the master tune was implemented for someone who had an accordion apparently somewhat detuned from concert pitch and is now a permanent feature. Footswitch type : Normally open contacts, press to close, non-latching, also called sustain pedal type. Quarter inch mono jack plug fitted. Power unit : 7.5 -> 10 Volt AC or 9 -> 12 Volts DC of either polarity at 300mA or greater recommended (Actual consumption is 200mA Max). 2.5 mm power plug. No memory backup batteries required. Audio out : normal line out levels of around 1V.RMS on quarter inch mono jack socket. This output will also drive ordinary medium impedance stereo headphones for personal practice. Standard MIDI IN and MIDI THRU sockets provided. Right-hand 2 on Ch 1 (or Ch4 if sent separately). If the extended MIDI mode is selected (power on holding chord bank) then you can activate some Control-change message reception, the selection includes Sustain, Volume, Modulation, Pitch-bend, Program change. Do the same again to cancel this mode or load ‘factory presets’. Normally Rh2 will play along with Rh1 but if MIDI is received on Channel 4 then the Right-hand 2 (Rh2) controls will automatically switch to Ch4, so Rh2 may be played separately from Rh1. Once this has happened, to make Rh2 go back to Ch1, restart the unit i.e. switch off and then on again. 38 note polyphony in total is available i.e. the module will play up to 38 notes at a time depending on the particular sounds selected. Some right-hand sounds have up to 4 layers of instruments. (For compatibility with the ‘Cavagnolo’ electronic accordion system, it will also respond to channels 14, 15 & 16. Right-hand on channel 16, chords on channel 14 and bass on channel 15 if set to do so – see the ‘Power-on Functions’ chart). As normal mode but with selection of 128 sounds and the reverb setting programmable into the 46 instrument selection buttons with footswitches 1 & 2 or Mute Rh1 & Mute Rh2 used for stepping through the available sounds. This mode may be entered or exited during normal playing mode by holding the Bass bank and Rh2 mute buttons simultaneously. The Rh1 & Rh2 mute lights will flash to let you know you are in this mode. 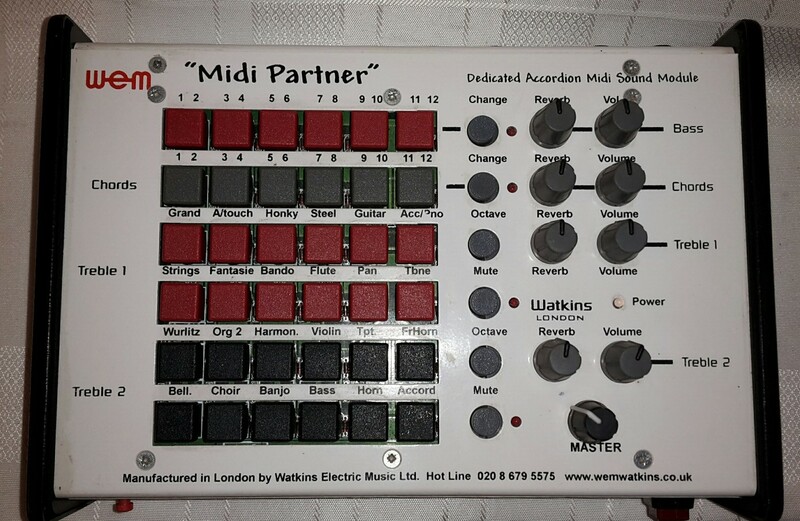 To buy this Watkins Midi Partner 1 or get more details, please call our Rochdale store on 01706 658283. You can pay by credit/debit card or Direct bank transfer.